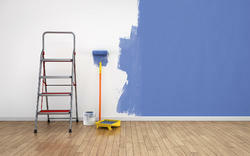 We are professional painting contractors. If you think painting your home is a headache, there is a solution close at hand. Set yourself free from all the hassles of painting a home. With Probfix Engineers get a home visit, cost estimation, colour consultancy, painting by experts, professional supervision, post-paint clean up. Note:- Deals in Mumbai Location Only . We are engaged in offering an optimum quality array of Home Painting Services for our esteemed customers. Offered array of painting services is executed as per quality principles. In addition to this, these painting services are acknowledged for its timely execution.